Inbound Marketing Tools play a very vital role to capture leads, track results and manage the whole marketing process. We use variety of SEO/web marketing tools that are essential to make the inbound marketing methodology work for your business. We use some essential inbound/content marketing tools and services and go through several procedures to make the inbound marketing methodology work for your business. Marketing automation refers to the software that exists with the goal of automating marketing actions. We use tools like HubSpot Customer.io, and Constant Contact. We use LinkedIn Analytics and SocialMention.com as Brand Awareness measurement tools. It is an effective tool for measuring B2C brand awareness. With help of LinkedIn Analytics dashboard we can easily spot how many visitors are viewing your LinkedIn Profile and the content in it. It is a site that helps to monitor your social media presence across multiple platforms. It also helps to determine whether your social mentions are positive or negative. ORM is all about improving and restoring your brand’s name. We provide the best services and use top ORM tools in India. Tools for ORM are Google Alerts and SocialMention.com. Google Alerts searches for blog posts, articles and news stories in its search engine database based on requested queries. It also provides email alerts with the results. Along with the requested queries, it displays information about Brand strength, Sentiment, Passion and Reach. It is a system for increasing the percentage of visitors to a website that convert into customers. It is a CRO testing tool that shows you if your content is too difficult to understand for your target customers. It is used for CRO analysis. It helps to create conversion metrics that allows to create goals on whatever conversion metric you want in Google Analytics. Influencer marketing drives your brand’s image to the larger market. It helps you reach wider audience, and create more trust between you and your followers. This tool by moz makes it easy to find relevant topic and location on Twitter. It organizes influencers into lists, find best influencers and track what they share. Tool we use for analyzing page speed is Google Developer’s PageSpeed Insights. Google Analytics includes Google Website Optimizer rebranded as Google Analytics Content Experiments. It helps in increasing visitor conversion rate and visitor satisfaction by testing various combinations of website content. It is an online marketing and web analytics company acquired by Adobe Systems in 2009. 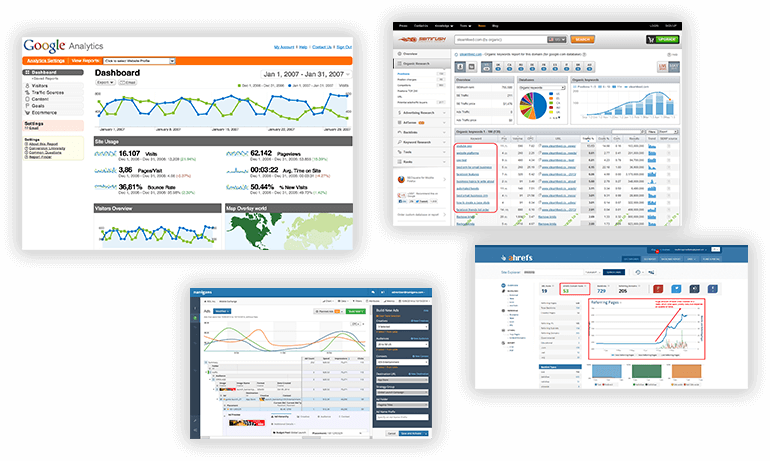 Omniture include different products like SiteCatalyst, Test&Target, Discover, SiteSearch etc. Axure is a tool used for making wireframes or prototypes. For display advertising we use tools like Google Display Planner, and Google Adwords. It helps to plan your Display Network Campaigns and also shows the potential reach. It offers display and text ads in association with the highly targeted keywords. YouTube Analytics Data help in collecting information on various metrics such as number of views, user engagement etc. PPC is a model of internet marketing in which advertisers pay fee each time one of their ads is clicked. It covers both AdWords and Organic search results, adding data like Keyword value and volume to the ranking data. It also tracks Google’s global search results. It shows your competitor’s most profitable keywords and advertisements they are buying or ranking for in the organic search results. It estimates the number of Google AdWords ad clicks and bid prices for the top advertising position. It helps to track your ad impressions to see how much traffic they get. Remarketing helps you reach people who have already visited your website or app. For Remarketing we use tools like AdRoll and ReTargeter. DropIn and InMobi are the tools we use for Mobile Advertising and help you make your ads appear on Mobile devices. InMobi enables customers to discover new products and services by providing personalized and contextual ad experience on mobile devices. The platform tie-up with the local business Facebook pages and generate mobile ads automatically using a business’ own images and text. AgoraPulse operates in multiple languages and it is used to track enhanced engagement analytics across Twitter, Facebook and Instagram. It is used to measure the value of traffic coming from social sites, how visitors behave, and if any conversion is taking place. It is the most advanced analytics platform. It tracks user interactions with mobile and web applications. Collected data is used to measure user engagement and retention. Want ToGet More Business And Increase ROIFrom Your Website?